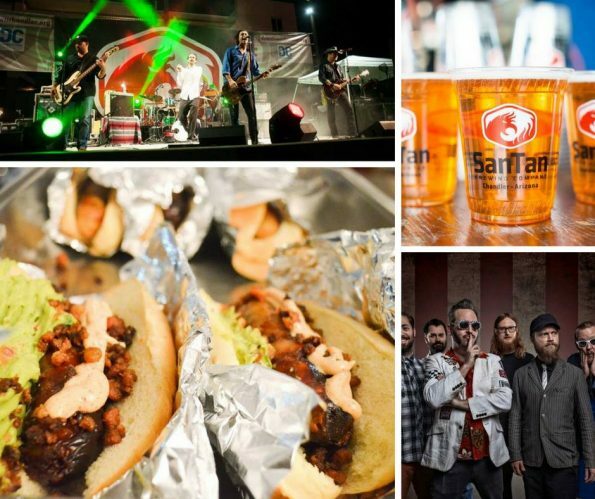 Celebrating SanTan Brewing Company’s 9th anniversary, Reel Big Fish and Roger Clyne & the Peacemakers will perform live at Oktoberfest on Saturday, October 1, 2016. Set for downtown Chandler at the Dr. AJ Chandler Park, 178 E Commonwealth, Chandler, AZ 85225. Doors open at 3 p.m.
Don your lederhosen, dirndls and get ready for a bounty of festivities as SanTan Brewing Oktoberfest returns with amazing fall foods, craft beer and games galore. Presale tickets are available online for $12 at www.santanoktoberfest.com, day of admission is $15. Food highlights include Beignet Babes, Fry Bread, Gorilla Cheese Truck, Honey Bear’s BBQ, Hubert’s Lemonade, Nicastro Wood Fired Pizza, San Francisco Chocolate Factory, SanTan Brewing Company, The Hitchin Post, The Treatery, Tom’s BBQ and Waffle Love AZ. 3:30 p.m.- Let the “Beer Games” Begin! Special thanks to the official 2016 SanTan Oktoberfest sponsors: SanTan Brewing Company, Bashas’, Downtown Chandler Community Partnership, Crescent Crown Distributing, Global Bikes, Von Hanson’s Meat Market, Earnhardt Chrysler, Jeep, Dodge Ram, Phoenix New Times, Rosenstein Law, Yelp Phoenix, the Arizona Canine Center, Essentia, Titio’s Handmade Vodka and Avilla Homes. CategoriesFood Events, Local Food Scene, Press Releases, Press ReleasesTagsBeignet Babes, food events, Fry Bread, Gorilla Cheese Truck, Honey Bear’s BBQ, Hubert’s Lemonade, Local Food Scene, Nicastro Wood Fired Pizza, Oktoberfest, Press Release, Reel Big Fish, Roger Clyne & the Peacemakers, San Francisco Chocolate Factory, San Tan Brewing Co., SanTan Brewing Co, SanTan Brewing Company, Ska Music, The Hitchin’ Post, The Treatery, Tom's BBQ, Waffle Love AZ.